Music is widely acknowledged as one of the most potent and emotive ways to tell a story and send a message. Yet, inexplicably, no major artists in favor of Article 13 have used their talent to tell the world why it should pass. In that silence, UK rapper Dan Bull (with support from Grandayy and PewDiePie) has now seized the day - to explain why it shouldn't. After being proposed by the European Commission two years ago, tomorrow the European Parliament will vote on whether to accept amendments to the Copyright Directive. The run-up to this potentially historic event has proven divisive. Creative groups of all kinds – led by the major international music labels – have argued in favor of Article 13 to “secure the future” of the industry – largely by forcing sites like YouTube to pay a ‘fair rate‘ for musical works. Opponents, on the other hand, have declared war on “upload filters” and “censorship machines”, rallying in large numbers this past weekend to air their concerns and put pressure on lawmakers. While they do not want ‘bots’ to control the Internet, they have been accused of being ‘bots’ themselves, a claim they hoped to dispel with these physical protests. At times, the war of words online has been horribly bitter, with insults traded on Twitter, in particular. Accompanying that has been the publication of many lengthy statements from industry groups, explaining why they need to protect the livelihoods of musical artists. Strangely, however, supportive interventions from artists Paul McCartney, Placido Domingo, and Adele have been notable in their brevity, with the vast majority of the industry’s greatest assets remaining largely silent. It’s a somewhat curious situation given the power and reach of music. The writers have been writing, the lobbyists have been lobbying, the politicians have been politicking, and the activists have been shouting. So why haven’t the musicians and singers been playing their hearts out? Well, out of the silence has stepped one, although his message is probably not what the music industry would’ve liked to hear. UK rapper Dan Bull, who first made it big rapping about controversial topics in the copyright space, is now back with a new track. After a long hiatus serving the gaming community, he’s returned and used the music industry’s most powerful weapon against it. On Friday, Bull released a video and rap titled “RoboCopyright” and invited everyone to quickly “remix this before it’s illegal”. 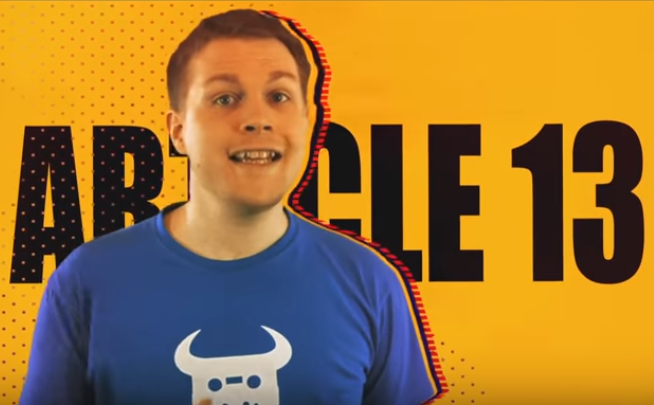 Working with Bull (alongside a cameo from PewDiePie), Maltese music producer and YouTuber Grandayy did just that, delivering a powerful and polished track, slamming Article 13. Trump, of course, couldn’t agree that thing was ice cream, as Cohen was suggesting. Instead, he pointed to music and was almost certainly right. So, given the armies of fans at their disposal, why haven’t the world’s most popular artists been doing what they do so brilliantly to send a message in favor of Article 13? Tomorrow it’s possible they’ll learn that their efforts weren’t needed. Or, just maybe, they’ll be glad they didn’t alienate the YouTube generation when it all goes wrong.